The 100 Chrome all feature a brushed chrome cap and nickel trim. Slightly more 'up-market' than the 100 Lacquered version the Chrome has a little more gravitas and substance. In the all chrome version, the brushed chrome finish is extended to the barrel, providing an interesting contrast with the highly polished nickel trim. The black version has a solid gloss black barrel, again providing interesting contrast, while the blue and red have a translucent lacquer, enabling the brushed chrome barrel beneath to show through. 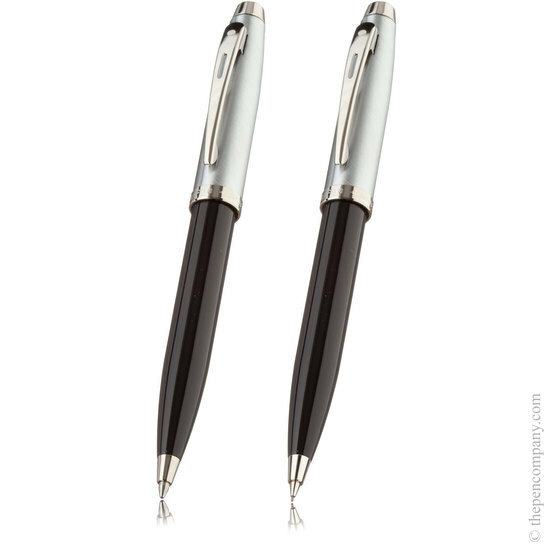 The fountain pen and rollerball pen both feature a push-fit cap, while the ball pen and mechanical pencil each feature a twist-action mechanism. The ball pen and mechanical pencil are available as a two piece set.